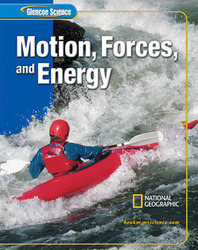 Motion, Forces, and Energy, as a part of the Glencoe Science 15-Book Series, provides students with accurate and comprehensive coverage of forces and Newtons laws. The strong content coverage integrates a wide range of hands-on experiences, critical-thinking opportunities, and real-world applications. The modular approach allows you to mix and match books to meet your curricula. comprehensive reading strand. From in-text features to ancillary components, every student’s reading needs are met. Expand your formative and summative assessment tools. From the beginning of the chapter to the final exam, ongoing assessment gives you the tools to make sure students understand the concepts. Give your students more opportunities to master key concepts with our highly interactive Virtual Labs CD-ROM and StudentWorks™ Plus CD-ROM. Spend more time focusing on your students and less time planning with Glencoe’s extensive technology, including powerful tools like LabManager™, TeacherWorks™, Interactive Chalkboard, and ExamView® Assessment Suite CD-ROMs.